are there any working demo from this two plugins out there? i saw in the backend of the demo that the "product page clothes design" plugin is installed but unpublished. it is not possible to enable so i can`t see it in action. Well done, you're right we have set a demo page to show the Design Clothes plugin in action. Use this link , to see it on our demo website. 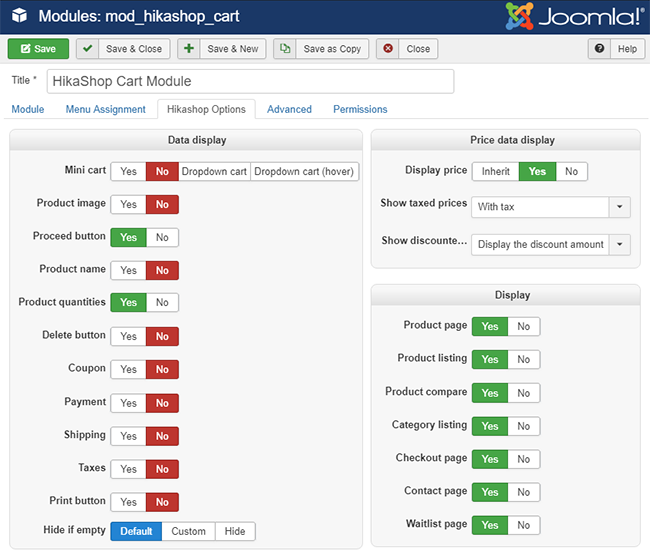 For the Cart Module Design, we had set an article to show as well the plugin, but isn't ready yet, I work on it this may be ready quite soon. Last edit: 4 months 2 weeks ago by Philip. Philip wrote: For the Cart Module Design, we had set an article to show as well the plugin, but isn't ready yet, I work on it this may be ready quite soon. hi, is the Cart Module Design article ready? Yes, it's now done, sorry for the delay, you can see the Demo, here on our HikaShop Demo website. i can't see the config of the module in your demo website. there for my question, would it be possible to show only the shopping-trolley symbol without articles and with articles in it? what i want to archive is when there is no article in the shopping-trolley it should show only the trolley, but if there are some articles in it should show the shopping-trolley symbol plus the number how much articles beside of the trolley. is this possible to set this out of the box with the module? or do i have to customize this for my needs? See this tutorial , to learn how to proceed. Last edit: 2 months 2 weeks ago by Philip. I would like to achieve the result from the picture shown below. Unfortunately the linked tutorial is about something else. Could you guide me to the right one, or provide some css code? I have the cart module in the header top bar and would like to show only the cart symbol, the quantity and the price. - You haven't it, and just Css won't be enough to reproduce this kind of result. Can you precise from where do you speak please ? [MODERATOR :]We are really sorry for the answer delay, we have faced an issue with our work tools which lead us to not see your message until now. This issue only concerns the first message of users, and so we are sorry that our first contact with you didn't go well. Once again sorry for the inconvenience. Last edit: 1 week 3 hours ago by Philip.